You are welcome to print out the following information for your personal use. If you use this for teaching or other uses please give me credit. Using teflon pressing sheet for fusible appliqué. Cut fabric a little larger than the actual finished size of the shape you want. Open teflon sheet and lay your piece of fabric the wrong side up on one half of the sheet. Cut a piece of fusible web slightly larger than the fabric and lay it on the wrong side of the fabric. Fold over the teflon sheet so that the fabric is sandwiched between two layers of teflon sheet. Iron the teflon sheet for about 4 seconds with a hot, dry iron and let cool for a few seconds. Open pressing sheet and peel off the fused fabric. Wipe the sheet clean with a small wad of fabric to remove every trace of melted fusible web left on the sheet. Draw the desired shape on the reverse side of the fabric or cut free hand with a sharp scissors. Make sure that there are no little "fringes" of fusible showing around the edge - these will stick to your iron. To make sure your iron stays clean, use the teflon pressing sheet to iron the cut shape into place. Note: Use 'Hot Iron cleaner' to keep you iron clean. Tips to get creative juices flowing. Make quickies, tiny collage compositions, to loosen up your creative response before settling into a big project. This is a potent way to jump start ideas. Allow yourself down time, to day dream, stare at your fabric - ideas need incubation time. Solitude. Often a luxury, but an essential ingredient for being creative. It may mean a small adjustments to your routine or you may have to fight like hell to get it - either way you have to have it. Enter a competition or arrange a solo exhibition. Nothing like a deadline to motivate creative production and stretch creative vision. keep courting the unknown and move out of the safety zone. Physical exercise is vital - it balances mind and body and keeps one grounded and clear headed. Don't take on a challenge that you really dislike in the hopes that it will be good for you - it may breed resentment and that's not good for creative juice. Don't worry about success or failure - just do the work because it needs to be expressed wether it's a great piece or not. It becomes a vital stepping stone to more interesting work. Self improvement, stress management and inner work is all part of letting go of blocks to the creative flow. This is an ongoing process. Experiment with different block buster techniques and find ones that work for you - for example: meditation or 5 minutes of relaxation and deep breathing does wonders to clear the mind and get you focused on creative work. Beyond the Horizon: Small Landscape Appliqué. Quilt Artistry - Inspired Designs from the East. Color on Paper and Fabric. This is a very useful book for those wanting to find clear instructions for surface embellishments like : oil paint sticks, metallic powders, glass plate printing, acrylics and so much more. The Creative Artist: A Fine Artist's Guide to Expanding Your Creativity. This is an exciting book and very interesting web site. If you are working towards developing your artistic approach to your quilt making, this is a good book to get. Barbara Lee Smith. Threads Books, Taunton Press. I adore this book and if I could only choose one book that is so packed with inspiring interviews and techniques by various textile artists, this is it. 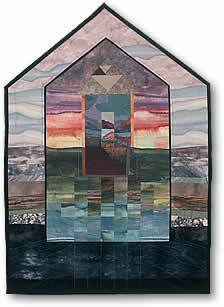 It covers more that quilts to include all stitchery work. You can often find reasonably priced used copies. Design Basics. David Lauer, Pub: Holy Rinehart Winston. The basic principles of design explained succinctly - highly recommended. This book is a perfect course for teaching yourself about design. A Creative Companion - How to free your creative spirit. SARK pub. Celestial Arts. This is a playful, joyful book that helps one to just lighten up and think about integrating the creative into everyday events. Ayako Miyawaki: The Art of Japanese Appliqué. Pub. The National Museum of Women in the Arts. 1991. This is the work of one of Japan cultural treasures, and if you love appliqué and powerful design this book will leave you awed. This book is one of my most treasured, inspirational books and I’m sure glad I bought it back in the day! Keep you eye open for a copy of this one.